Customization of clothing comes in all different forms. Whether you are using screen printing, direct to garment printing or digital printing, you can be sure to have a thoroughly unique design and experience every time. Nothing promotes your business, sports team, or event better than a t-shirt with custom screen printing, and the best part is, you get to pick the material, so you will no doubt be comfortable. But there is some dispute as to which method of printing is best to use. In reality, each has its own advantages and disadvantages. It really just depends on the kind of design experience you are looking for. Screen Printing is the traditional approach to customizing clothes and other materials. It offers a sharp-edge image often by way of a stencil. Originally used for artistic purposes, custom screen-printing is now one of the more inexpensive ways to transfer and image to a piece of clothing, at least when compared to direct to garment (DTG) and digital printing. But unfortunately, this method of printing falls short in the color variation and the vibrancies of those colors aren’t as crisp as they might for be DTG or digital printing. Still, it is the most hands on, quickest and traditional approach. 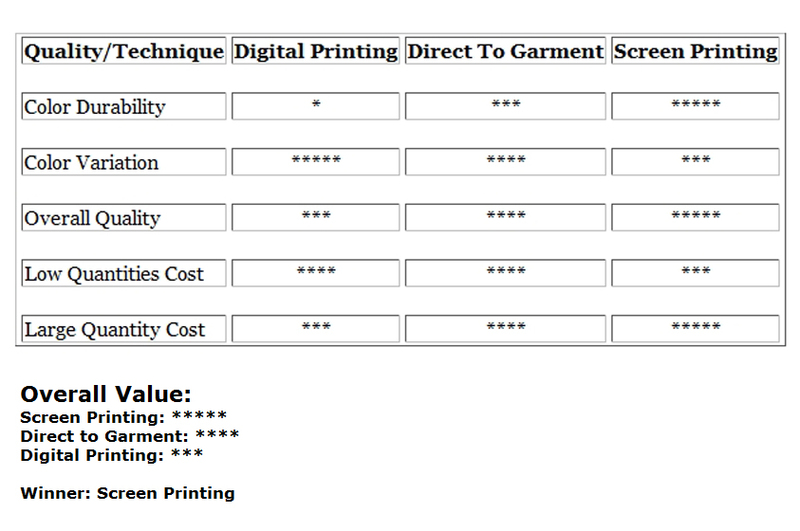 So in regards to custom screen printing vs direct to garment or digital printing, it is really a matter of preference. Specifically speaking in regards to just custom screen printing vs direct to garment, you’ll find that Direct to Garment printing is much slower, but cleaner. Custom screen-printing tends to create variations in graphics from print to print due to small imperfections in the method, but direct to garment printing smoothest it all out for a continuously clean look. But one of the biggest pitfalls of “DTG” printing is the simple fact that it is far more expensive than screen printing. This is not to mention that you can run more pieces in less time when working with the traditional screen printing method. But what about the final method: digital printing? 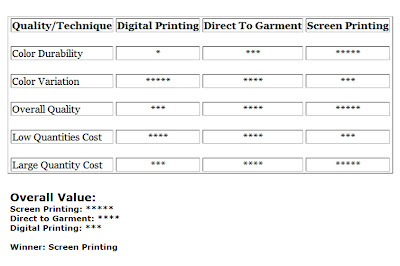 When discussing custom screen printing vs digital printing, you must keep in mind that “digital” indicates “newer”. The color variation of digital printing is the most wide spread and the exuberance of each is always brilliant. The color and detail created in digital printing is one of the biggest threats to traditional custom screen-printing. But there is still one outweighing factor that combats this aspect. While digital printing is certainly quicker than direct to garment printing, it can not beat out screen printing’s top spot. Additionally, you’ll find that digital prints will show more wear and tear than most other methods. Still, there is room for debate among printing experts. Whether you are hoping for a business shirt, sports team printed ball cap, or just something you want to say on an article of clothing, you’re going to have to pick a method of printing. Although you may not do it yourself, it will still affect the cost you pay and quality of your print. They all have pros and cons, now it’s up to you to decide! Screen printing or digital printing is the most trendy ways nowadays. Most of the people like screen printing while other like digital printing which main example is embroidery digitizing.